On a sweltering first of July 150 years ago Confederate forces under Robert E. Lee came face-to-face with a Union army led by General George Meade. For three days the greatest battle of the American Civil War raged in front of the small Pennsylvania town of Gettysburg. 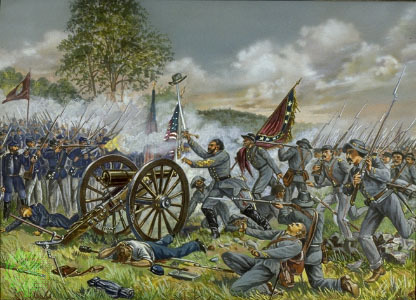 The culmination of the battle was the gallant but futile Pickett’s charge, during which Confederate forces suffered some 50% casualties, many inflicted by men of the 8th Ohio Volunteer Infantry. Though the Confederates never recaptured the offensive of that moment, the war was far from over, continuing for one-and-a-half more years. 75 years ago, surviving veterans of the Blue and the Gray came together to remember the 75th anniversary of that fateful battle. Remarkable footage survives, including the following excerpts from Paramount and Universal newsreels of the era. Even as the guns resounded at Gettysburg, rebel cavalry under the command of Kentucky’s John Hunt Morgan (“the Thunderbolt of the Confederacy”) struck fear and terror across the Ohio border. This July also marks the 150th anniversary of Morgan’s Raid, when the Civil War struck closest to home for Hamiltonians. Stay posted for more historical reflections this summer!